Way to go Brits… love it. In case Obama didn’t understand how the Brits felt when he sent the bust of Churchill back to England, a gift from the English during the Bush administration, this shows it. These pilots have not forgotten Obama’s disrespect for America ‘s friend and ally. Enjoy the Brits’ humor on Obama’s last visit. They will never forget nor forgive! The Brits may be prim and proper but they still get their point across. Harrier jets fly past (fly-bys) over Downing Street in an air show salute to Obama. 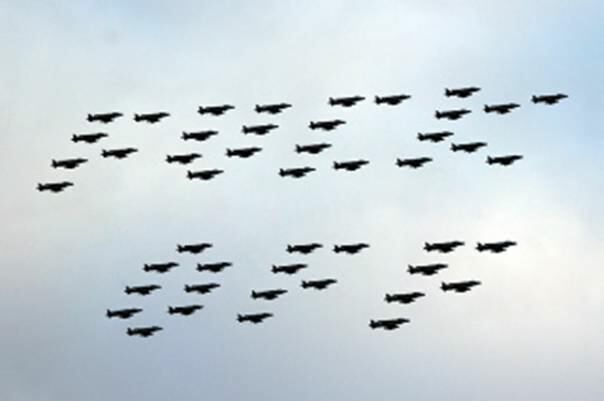 It’s good to see the RAF have a sense of humor. Look at it from an angle or lean back in your chair, and squint; squinting works best. Posted in Barack Obama and tagged Democrat, Humor, Obama, United States.